The halo series of Hollyhocks was developed by Thompson and Morgan of England. This series is the result of 16 years of plant breeding. 'Halo Blush' has large white flowers with a prominent fuchsia red halo and a yellow center. This series is very floriferous with dense flower spikes and dark green foliage. 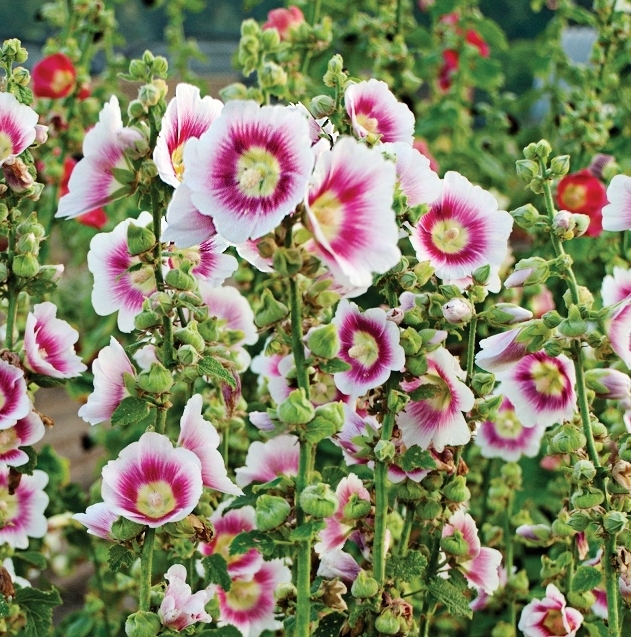 Hollyhocks prefer rich, moist but well drained soil in full sun. Once established they are somewhat drought tolerant. Because the foliage can be attacked by insects and foliar disease Hollyhocks should always be located where their "knees" will be covered by other plants. They may need staking in very windy sites but if they are at the back of a perennial border this is usually not required.